Ratio analysis is a popular technique of financial analysis. It is used to visualize and extract information from financial statementsThree Financial StatementsThe three financial statements are the income statement, the balance sheet, and the statement of cash flows. These three core statements are intricately linked to each other and this guide will explain how they all fit together. By following the steps below you'll be able to connect the three statements on your own.. It focuses on ratios that reflect the profitability, efficiency, financing leverageLeverageLeverage is a strategy that companies use to magnify returns, though it may also magnify losses. To increase Financial Leverage, a firm may borrow capital through issuing fixed-income securities (preferred equity and debt). Operating Leverage can be attained through fixed operating expenses., and other vital information about a business. The ratios can be used for both horizontal analysis and vertical analysis. While they are a popular form of analysis, there are many limitations of ratio analysis that financial analystsFMVA™ CertificationThe Financial Modeling & Valueation Analyst (FMVA)™ accreditation is a global standard for financial analysts that covers finance, accounting, financial modeling, valuation, budgeting, forecasting, presentations, and strategy. should be aware of. Image: Pyramid of Ratios from CFI’s Financial Analysis Course. One of the key factors in ratio analysis is the comparison to the benchmark companies of an industry. This type of financial analysis can be useful to both internal managementCorporate StructureCorporate structure refers to the organization of different departments or business units within a company. Depending on a company’s goals and the industry which it operates in, corporate structure can differ significantly between companies. Each of the departments usually performs a specialized function and outsider analysts of the company, as it provides significant insights from the financial statements. 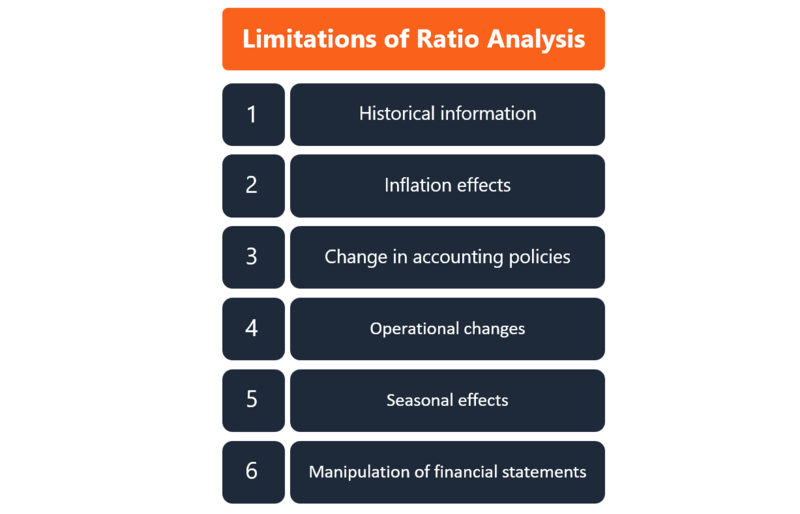 As with any financial analysis technique, there are several limitations of ratio analysis. It is crucial to know these limitations to avoid misleading conclusions. Historical Information: Information used in the analysis is based on real past results that are released by the company. Therefore, ratio analysis metrics do not necessarily represent future company performance. Inflationary effects: Financial statements are released periodically and, therefore, there are time differences between each release. If inflationInflationInflation is an economic concept that refers to increases in the price level of goods over a set period of time. The cause for inflation in the short and me has occurred in between periods, then real prices are not reflected in the financial statements. Thus, the numbers across different periods are not comparable until they are adjusted for inflation. Changes in accounting policies: If the company has changed its accounting policies and procedures, this may significantly affect the financial reporting. In this case, the key financial metrics utilized in ratio analysis are altered and the financial results recorded after the change are not comparable to the results recorded prior to the change. It is up to the analyst to be up to date with changes to accounting policies. Changes made are generally found in the notes to financial statements section. Operational changes: A company may significantly change its operational structure, anything from their supply chain strategy to the product that they are selling. When significant operational changes occur, the comparison of financial metrics before and after the operational change may lead to misleading conclusions about the company’s performance and future prospects. Seasonal effects: An analyst should be aware of seasonal factors that could potentially result in limitations of ratio analysis. The inability to adjust the ratio analysis to the seasonality effects may lead to false interpretations of the results from the analysis. Manipulation of financial statements: Ratio analysis is based on information that is reported by the company in their financial statements. This information may be manipulated by the company’s management to report a better result than its actual performance. Hence, ratio analysis may not accurately reflect the true nature of the business, as the misrepresentation of information is not detected by simple analysis. It is important that an analyst is aware of these possible manipulations and always complete extensive due diligenceDue DiligenceDue diligence is a process of verification, investigation, or audit of a potential deal or investment opportunity to confirm all facts, financial information, and to verify anything else that was brought up during an M&A deal or investment process. Due diligence is completed before a deal closes before reaching any conclusions.